If you ask me what I really do not like when working on mobile computer systems such as laptops or netbooks, then the answer is touchpads. Touchpads come in handy when no computer mouse is connected to the laptop, a mouse substitution so to say. The biggest problem that I have with a keyboard with touchpad is that I seem to have a gift for accidentally touching the touchpad with my hands while typing on the keyboard. That usually means that the cursor jumps around or other actions take place that prevent me from continuing to type. Touchpads tend to break my workflow fairly often. There are a few solutions for this. I tend to carry a external mouse with my laptop bag so that I can use the mouse and disable the touchpad. Other users may prefer a software based solution. Touchpad Blocker can automatically block accidental taps and clicks on the touchpad so that the actions are not carried out. It is in this regard similar to Touchfreeze which we have reviewed earlier here at Ghacks. Touchpad Blocker uses a threshold to determine accidental taps and clicks on the touchpad of the computer. This threshold is set to 300ms by default and can be changed in the program's options. 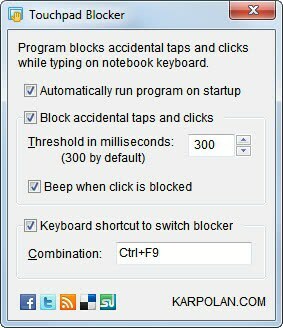 Other available options are to autostart the application with Windows, to beep when a click or tap on the touchpad is blocked and a keyboard shortcut to switch the blocker on and off (default Ctrl-F9). The application stays quietly in the Windows System tray after the initial configuration. Touchpad Blocker is compatible with most versions of the Windows operating system. A download is available at the developer website. Touchpads on all my machines are so hyper-reactive I figure I must have excess Chi streaming from my hands lol. I tried a lot of fixes like this a while back and most didn’t work right with Win 7 (Linux just install syndaemon -d which runs at startup).